Gripsweat - KALEIDOSCOPE / FAIRFIELD PARLOUR From Home To Home LP 1970 UK 1st Press! KALEIDOSCOPE / FAIRFIELD PARLOUR From Home To Home LP 1970 UK 1st Press! I've collected 50's, 60's, and early 70's records of almost every genre - Psych, Prog, Psychedelic Funk, Soul, Rhythm 'n' Blues, Pop, Folk, Garage, Acid, Freakbeat, Rock, Jazz e.t.c and everything in between for all my life!!! Obviously, 90% of the LP's I've ever gotten hold of are completely trashed from the hard living ways and the rock 'n' roll, drug and booze fuelled debauchery of all the wild parties of the times, but the golden 10%? Reluctantly, I've decided to offer them to all of you serious record collectors out there!!! I'm currently trying to set up a record label so unfortunately personal sacrifices have to be made when it comes to my collection, resulting in GREAT benefits for all you shrewd bidders and serious connosieurs of TRUE solid gold music history out there!!! Make no mistake, I'll try my best to consistently offer some of the VERY BEST records available on ebay, many which have taken me YEARS to find!!! I aim to put a weekly batch up (time permitting) every Wednesday, all timed to end 10 days later on Saturday night. I'll only ever offer THE BEST, MOST AMAZING, MOST IMPORTANT, VERY RAREST UK 1ST PRESS ORIGINAL RELEASE RECORDS I've got!!! I won't insult you with later 2nd pressings unless they are of exceptional quality and rarity. I'm sure you love good music as much as me, especially when it's a 1st Press LP, direct from the master tape, as the musicians intended it to be heard (none of this "digitally remastered",weak reissued, remixed rubbish from hired hands with one eye on the mixing desk and the other on the clock! If these session men really knew how genius should sound, surely they would've been geniuses themselves?! There will only ever be one Hendrix, and that's just a tiny example). I try to be one of the best sellers on ebay and would like to thank all of you potential bidders for your support and taste in music!!! I strictly grade all LP's I list, visually and sonically using the UK RRPG standards as customer satisfaction is highly important to me, and I'll always do my very best not to let you down. Be sure to add me to your favourite sellers list and check my auctions frequently as i'll be listing some gems that you just WON'T want to miss out on!!! Label & year : Original Vertigo 6360 001 LP , UK Stereo IMPOSSIBLY RARE 1970 UK 1st Press!!! AN ABSOLUTELY INCREDIBLE BARELY EVEN PLAYED EXAMPLE OF THIS PHENOMENALLY RARE PSYCH MASTERPIECE FROM THE BAND FORMERLY KNOWN AS KALEIDOSCOPE!!! AND WHAT AN ALBUM THIS FOLLOW UP TO TANGERINE DREAM AND FAINTLY BLOWING TRULY IS - A BEAUTIFUL BRITISH PSYCH CLASSIC!!! LP'S LIKE THIS ARE WHY WE COLLECT RECORDS!!! EFFORTLESSLY INVENTIVE - STUNNING MUSICIANSHIP, STUNNING SONGS, STUNNING SOUNDS AND UNBELIEVABLY INSPIRED MELODIES AND TIME CHANGES!!! ABSOLUTELY IMPOSSIBLE TO FIND LIKE THIS - BARELY EVEN SEEN A TURNTABLE, ONE OR TWO PLAYS AT THE MOST!!! OUTSTANDING AUDIO!!! THIS TRUE PSYCH MASTERPIECE IS WELL KNOWN FOR SELLING AN ABSOLUTE MINISCULE AMOUNT AND IS EASILY ONE OF THE VERY RAREST AND MOST SOUGHT AFTER PSYCHEDELIC FOLK CLASSICS OUT THERE, ESPECIALLY LIKE THIS!!! A STUNNING EXAMPLE OF WITHOUT A DOUBT ONE OF THE ABSOLUTE PINNACLES OF PSYCH!!! This magnificent band was previously known as Kaleidoscope (behind the two psych masterpieces, Tangerine Dream and Faintly Blowing), and this was their magnificent third LP under their new name and on their new label!!! And in terms of quality, it is RIGHT up there with the skyscraper standards set with their previous work!!! Sold next to nothing, but has gone on to become known as one of THE very pinnacles of the Vertigo label (this was the very first LP issued in the 6360 series)!!! To find an example at all is EXTREMELY difficult, but to find one in such INCREDIBLE barely played condition is OUTRAGEOUSLY difficult!!! Don't miss out on this magical classic, bid now!!! 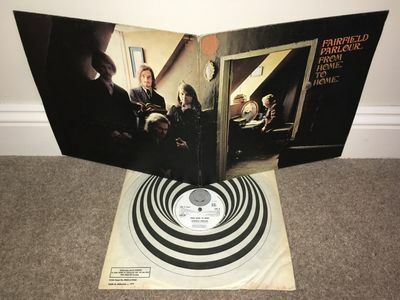 About : Ultra Rare Original 1970 UK 1st Press!!! This MASSIVELY RARE LP initially sold barely anything (LP's were also really expensive to most people back then!!!) and therefore had a very small run, and is INCREDIBLY HARD TO FIND, especially in this condition!!! AN absolute classic LP from this incredible band!!! An astonishing album that really DESERVES to be in EVERY serious 60's / 70's record collection!!! Don't miss out on this MEGA RARE LP!!! If you like good music, bid now!!! Classic UK 1st Press Vertigo labels!!! Both sides are AMAZING with NO signs of age, NO writing, NO stickers, and NO tears whatsoever!!! Just has an absolute MINISCULE amount of ultra light spindle marks which suggests that this has literally been played once or twice at the very most!!! IMPOSSIBLE for a 48 year old record!!! Both must grade overall at least as Near Mint!!! Summary : An ASTONISHING played once or twice example of this INCREDIBLY RARE psych masterpiece original 1970 UK 1st Press LP!!! Hard to find in ANY condition, but SERIOUSLY RARE TO FIND ONE AS TRULY PHENOMENAL AS THIS!!! YOU MAY NEVER GET THE CHANCE AGAIN, so don't miss out on this scarce opportunity to own a true piece of 60's/70's music history!!! Bid now!!! Please take a look at all my other auctions for many other ultra rare classic LPs, and feel free to contact me with any questions you may have. Thanks again for looking, it's truly appreciated!! Cheers!!! I've realized that most countries have their own unique grading system. I base mine strictly on the UK RRPG grading system (occasionally with a + or a - to indicate the higher and lower ends of the grade, though I only use these if i'm having real trouble deciding! ), so please check their chart for further clarity if you are unsure of what my grades mean. As a general rule, a mint record will be 100% perfect, an excellent record will be in fantastic clean condition with the occasional mild mark and minor use from the years, and a very good record will have noticeable, yet light visual markings and obvious signs of age and use, but will still remain clean with relatively light wear and will play fantastically well with plenty of life remaining in it. I very rarely offer records below the very good region unless they are of an EXCEPTIONAL rarity and playing quality...I hope this helps! Postage and packing (UK bidders) will be £4.99 signed for for the first item, £2.00 for every item after that. Europe buyers, postage is £13.99 signed for for the first item, £3.00 for every item after that. Rest of the world buyers, postage is £17.99 signed for for the first item, £3.00 for every item after that (orders over £30 need to be sent signed for). Contact is expected to be made within a day, and payment expected within 3 days of the auction ending, otherwise you may lose priority over the item and it may be offered second chance to the under bidder or relisted e.t.c. Contact is king! UK bidders, I accept paypal or postal orders. International bidders, I accept Paypal or Bank Transfer! Unfortunately, I can�t accept any other internet payment other than paypal. Please PLEASE get in touch via the ebay messaging system rather than opening a case if there’s any kind of problem, I will do my very best to sort it out. Please just ask if you have any questions or if you require further information. The photos below are of the genuine item, apologies for the occasional blurryness or glare from the light in some of them. If you would like further pictures or details, please ask. All my auctions start from a bare minimum price, so there is always plenty of opportunity for a bargain! Please check my other auctions for many more of the rarest, most awesome Vinyl Record items ever!!! THE BEATLES Revolver LP Parlophone 1966 Mono UK 1st Press! THE BEATLES With The Beatles LP Mono 1963 UK 1st Press!